Just when I started writing this article I noticed a new release of dojo was made available so I changed my recommendations to download the latest and greatest because newer is better right… Just to be on the save side I downloaded and installed 1.4 myself and guess what, our CheckboxTree widget stopped working. Ok, things happen so let try the release notes, it turns out several enhancements had been made to the dijit Tree widget but none of them explained why our widget stopped working, we are talking enhancements here. The only thing left to do was to open up the source but unfortunately dojo does not maintain ANY sort of change history in their code. After some investigation it became clear why our widget no longer worked, to make a long story short: The internal event handling had changed, in dojo 1.3.2 it was the Tree instance that would listen for and catch the _onClick events whereas in 1.4 this functionality has been moved to the TreeNode. 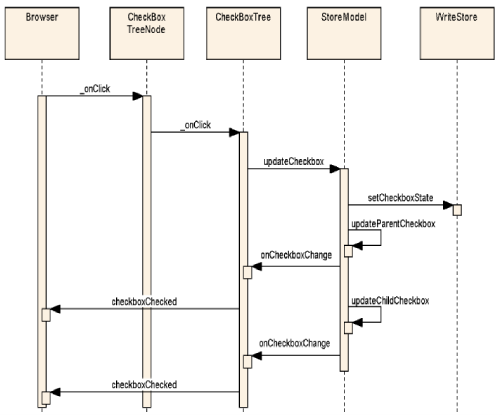 Once a TreeNode catches the _onClick event the only thing it does is calling the “legacy” _onClick method of the Tree but instead of just passing the event data, the TreeNode also passes itself (“this”) as the first argument to the _onClick method of the Tree. 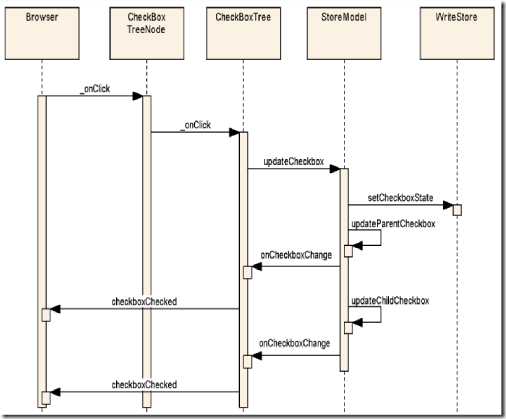 The sequence diagram below shows the new flow. Considering it is you who defines the external interface for your widget you will have to decide if you want to follow dojo’s lead and implement the version 1.4 public interface for onClick and onDblClick. If you are concerned about backward compatibility of your application (dojo.connect callback functions) I would recommend to stick to the 1.3.2 implementation at least for the time being. The next issue is related to an enhancement dojo made. 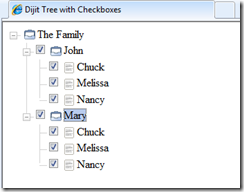 Remember when we talked about our _getParentItem method in step 7, I mentioned the dijit Tree did not support multiple parent references whereas the data store did. As of dojo 1.4 this issue has been fixed and as a result the internal mapping table “itemNodeMap” changed name to “itemNodesMap” in addition, in dojo 1.3.2 each entry in the mapping table held a single reference to a TreeNode instance whereas in 1.4 each entry holds an array of references. On line 182 we adjust the _onClick function declaration to accommodate the new nodeWidget argument and on line 189 we update the call to onClick. 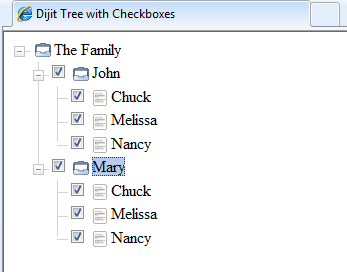 As you can see I have decided to make our CheckboxTree widget dojo 1.4 compliant, again it’s up to you. Notice that because the TreeNode is now passing itself as the nodeWidget argument we no longer need to call the dijit.getEnclosingWidget function. Let’s go to the next one, _onCheckboxChange. On line 200 we now use “nodes” (pural) as the itemNodesMap array holds an array of nodes as to only one in dojo version 1.3.2. As a result we need to start a loop on line 202 validating each possible node. 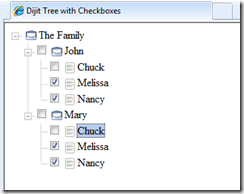 This can have some interesting visual effects for example: if your tree represents a family structure (mother, father and children) checking any of the children will have an effect on both parents. Ok, now for our CheckboxStoreModel. In order to support the multi parent references we will no longer break out of our _getParentsItem (notice Parents vs Parent in 1.3.2) method after fetching the first parent. We actually return an array of parents. On line 119 we declare parents as an array and on line 123 we add every individual parent to our array which is returned on line 129. This implies that _updateParentCheckbox will get an array back instead of a single instance. The picture on the left is what you should see as soon as the Checkbox Tree gets loaded. 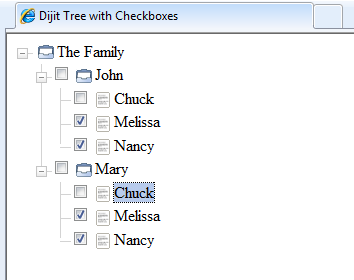 Now uncheck Mary’s child Chuck and notice what happens to his father John and John’s child Chuck. This ends our 1.4 tutorial.. Awesome work done !! thanks a lot ! how to get the selected value of a tree node? I realize this is approaching a year old but just happened across it and would like to correct one bit of misinformation. API backwards compatibility is promised for all non “private/internal” methods and properties ie: anything not starting with “_”… all of your broken methods were the internal methods used by the widget themselves, not the public extension points. With that being said, additions like this are always great to stumble across, keep up the good work! Thanks for a great dijit. I have noticed that the multistate checkbox functionality is a bit faulty in dojo 1.6 and 1.7. The thing is that the the functionality overall works, but the multistate symbols does not get updated before the cursor hovers the parent checkbox. Any chance there will be another upgrade for this? I hope to be able to fix the issues related to DOJO 1.5 and beyound in the next two/three weeks.